At the time of writing, I am sitting in the second row from the top of a sumo arena watching a host of big guys in “mawashi” wrestle as a part of an old Japanese Tradition. Sumo wrestling is way different from what I expected. I expected it to be more action packed, but instead it’s minutes of staring down each other and seconds of struggling before one gets thrown out of the ring. The crowd is large though, proving that sumo is a sport of great interest among the Japanese people. 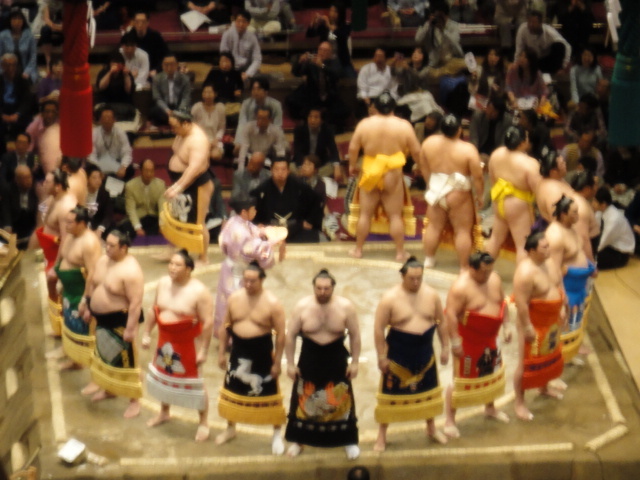 While most who don’t understand the culture and history behind sumo may find it boring, I find it interesting. The staring down of the two “reikishi” (wrestlers) is irritating, but it builds great anticipation of the actual struggle and finding out who will lose and if they will fall to the ground or get thrown or pushed out of the ring.